The two-sided sheets give information about qualifying to vote and doing it properly so ballots are counted. 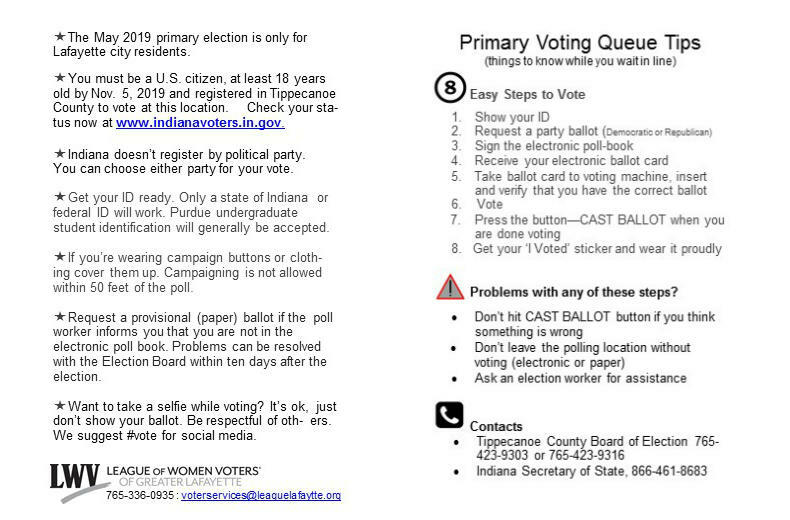 Despite some opposition from the head of the Tippecanoe County Election Board, voters will receive pamphlets this year reminding them of rules for voting. League Voter Services Committee Chair Ken Jones says the importance of the reminders grew last year, when some voters failed to check their ballots, and then were surprised by a machine error that switched some Democratic votes to tallies for Republicans. But Republican Election Board Chair Randy Vonderheide initially tried to stop the handouts from being distributed. “Don’t we have sample ballots out there for them to look at? Wouldn’t you hope, I mean, the time that some of these folks take at our polling locations, you would think that any distraction wouldn’t be what we want to do,” Vonderheide says. He also tried briefly to discredit the League because it sometimes takes stances on voting issues, even though it’s a non-partisan group which does not endorse candidates. The discussion turned when Election Board member Joe Bumbleburg stepped in. The pamphlet tells voters the qualifications for voting and reminds them not to make common mistakes, such as taking a ballot and then not voting or failing to make sure each race has been checked off.